We’ve added two metrics here – one is an area coverted by green lines, a one standard deviation from the average (which is about 19). Most of the time the Nifty is within the 1 SD range. The orange dotted lines is a 2 standard deviation move – that is, a much higher extreme. (beyond 2SD is noted at about 5% of the observations). We are currently at about 23.4 – probably a little bit higher today. 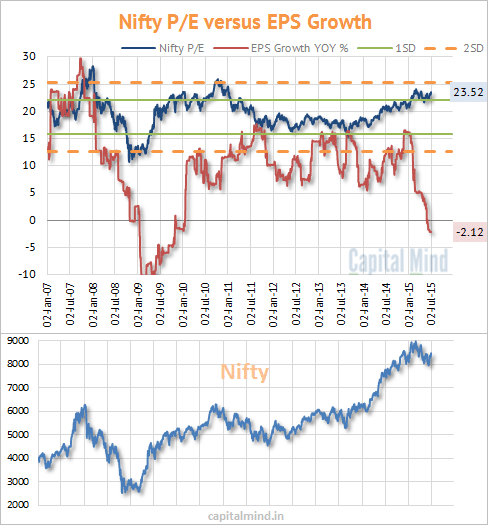 The 25 P/E number is a good 500 points away – the Nifty needs to be beyond 9000. The last two times we crossed 23 P/E, our Nifty earnings were growing strong, or trending up. Given where we are right now, at -2.12% Earnings Growth for the Nifty as a whole, we are really in extreme territory! However results are going to come in starting very soon – good, or not? That will determine where valuations really are.